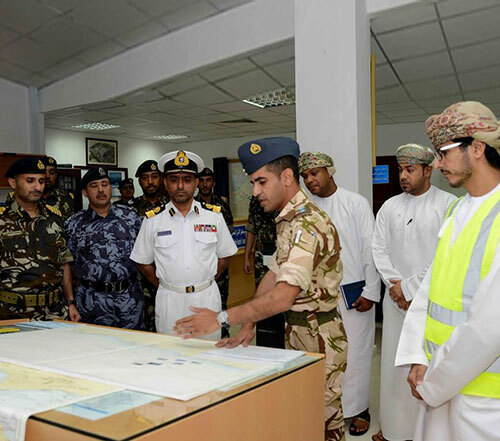 A delegation from the Italian Naval Forces, headed by Captain Francesco Maras, visited Monday the Maritime Security Center (MSC) in Muscat, Oman. Upon arrival, the delegation was received by Commodore Mansoor bin Mohammed al-Kharousi, MSC Chairman, Oman News Agency (ONA) reported. The Italian delegation was briefed on the MSC’s duties, tasks and roles, represented by managing and leading maritime security operations against marine risks, including search and rescue operations and the protection of the marine environment from various risks. The delegation also viewed modern devices and equipment used in supporting maritime security operations. Furthermore, Vice Admiral James Malloy, Commander of the US Naval Forces Central Command and his accompanying delegation, accompanied by Rear Admiral Abdullah bin Khamis al- Ra’eesi, Commander of the Royal Navy of Oman (RNO), also visited the Maritime Security Center (MSC) Monday. They were received upon their arrival by Commodore Mansoor bin Mohammed al-Kharousi, MSC Chairman. The US guest was briefed on the duties, tasks and roles carried out by the center, represented by managing and leading maritime security operations against marine risks, including search and rescue operations and the protection of marine environment from various risks. The visiting delegation was also briefed on the center’s coordination role among Sultan Armed Forces (SAF) corps, security departments and civil institutions in the Sultanate. The US delegation viewed modern equipment and devices in supporting maritime security operations. Earlier Monday, Rear Admiral Abdullah bin Khamis al- Ra’eesi, Commander of the Royal Navy of Oman (RNO) received in his office at Mu’askar Al Murtafa’ Vice Admiral James Malloy, Commander of the US Naval Forces Central Command. The two sides exchanged cordial conversations and discussed several matters of common concern in maritime fields between the two friendly countries. The meeting was attended by RNO senior officers.